I’m a writer because I write. I was overdetermined to pursue this path, thanks to a wordy, nerdy family and my own predilections. Like any kid, I had my finger-painting years, but they didn’t last. I started reading at two, thanks to my mom and my siblings, who (oddly, perhaps) thought that putting letters in front of a baby would be fun. Intentional or not, they made me a voracious reader, like a Japanese movie monster eating everything in sight. With reading came writing. Writing, for me, was practically pre-ordained. Like a luge run, there was no other path for me. Being a teenager was rough. But I found Tom Robbins: fiction full of brainy research, humor, and sociopolitical commentary. I was sold on writing. But somehow, I got on a different track, which led to two decades overseas as a sociologist studying conflict, development and poverty. (When a sociologist is lucky enough to get a job, she tends wisely to cling to it.) I do write a great deal at work: over 1000 pages just last year analyzing data on poor families and an absent government in Colombia’s conflict-affected rural regions; and a couple dozen more examples here. As a result, I write well. I’m a good editor. I see the big picture and the little details. I’m the Designated Scribe everywhere I’ve ever worked. But of course those reports aren’t Robbinsesque, or Alice-Walkeresque, or Jasper-Ffordesque. On their own, they weren’t enough to satiate that desire to write. I found my way to National Novel Writing Month (NaNoWriMo) twelve years ago, and hung on like it was the only dinghy in the literary sea. November became an outlet for my festive, noisy, gregarious, mischief-making imagination. Thanks to NaNoWriMo, I have four book manuscripts polished to varying degrees of shine. Three of these comprise a series about a sarcastic English stage actress who is cajoled into spying for MI6. The idea for the first book, called Spy Act, came from a suspicious cousin back home in Colorado. While I was working overseas, this cousin visited my mother and they commiserated on my job, which neither fully understood. My cousin convinced my mother that the reason they didn’t understand what I did was because my “job” didn’t exist. “She must be working as a spy over there in Afghanistan and Pakistan or wherever she is.” Mom called me at 3:00 a.m. Kabul time in a state of panic, but finally I just asked her when she remembered me ever successfully keeping a secret, and that was that. Mom was assuaged, and the idea for the novel was born. 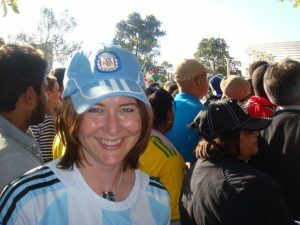 In 2011 I started this blog, called Wednesday Missives, out of an unfulfilled hope that I’d write weekly. Though I’ve posted nowhere near that frequently, I did make it up and over 100 total posts this year. It has helped to keep me in touch with my family, and to keep them in the know on my travels and work. It’s full of words and pictures, essays and fiction, English and Spanish, family and work, and a carefully curated bit of my inner life. Not enough to get sappy, but a couple of snapshots of what lurks behind these baby blues, or deep inside my ribcage. Ramon and I left Madrid just a few weeks ago, as of this writing, and are starting a new adventure in Tunisia. I’m launching a career as an independent consultant, so I can choose my projects for passion, and carve out time for writing fiction as well. As long as Tunis holds up its end of the bargain in terms of wifi and air conditioning, it should be a wild ride. Keri, you’re so perky. What’s up with that? Long ago, in a Denver suburb that feels a universe away, I wanted desperately to be popular. What can I say? I was a big Judy Blume fan. Anyway, at cheerleader tryouts, I went farther than ever before while doing the splits. My hamstring ripped off its rollers and I was rushed to the hospital. Somehow, the judges still named me to the squad. Maybe they felt sorry for me; maybe they had a nerd quota. I prefer to think my desperate enthusiastic over-reach showed I was a true Leader of Cheers. No one practiced harder, shouted louder, or shook it like I did, but popularity did not ensue. The squad made sure I knew I was out of place, and my cheerleading days didn’t last past that year. But that’s still me: enthusiastic, looking for the best in others, cheering them on. I do it in my writing group, in classes at Madrid’s Escuela de Escritores, and online activities with the Women’s Fiction Writers Association, and the University of Iowa’s International Writing Program. If you’re having trouble finding your motivation, let’s talk. I can help boost you. After all, I already know how to boost me, and I’m really not easy. I figured out a phrase that defines me at work: I’m both critical and compassionate. It’s necessary when evaluating someone else’s work to have a critical eye, but to understand and strike a friendship with the ones you’re evaluating. You need to know how they feel, and how it would feel to be criticized professionally. I think I’m like that in my private and writing life, too: I hear what someone is trying to do and then pull out all the stops to help them get there. Also, I like matching sporty outfits, especially if they involve skorts. It’s a weakness. I saw a coffee mug in a knickknack shop in Madrid. Built right into the porcelain was a slot at the bottom of the mug where one can place a cookie. Weird, but okay. It cost ten euros. I guess there is a market for that sort of thing, particularly when one needs to get a birthday gift for someone in the office. But after I saw it, I noticed that there is a very similar slot at the bottom of the bathroom wand brush holder. Why? Is it for a cookie? Would that sell? Why would I imagine a cookie there? What will it help humankind to think something so gross? Why on earth does that give me hope? There are no good answers to those questions. 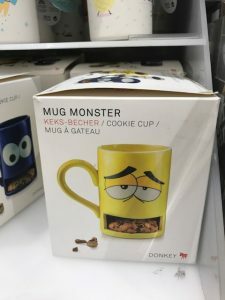 There’s probably no good use for such a coffee mug, and certainly no use for a cookie in a toilet brush holder. But it reminds me there’s infinite imagination space in my brain, and that that’s marvelous. It shows me I’m not done blooming, that I’m not done figuring things out or asking questions that could be comical or enjoyable or illuminating. It means I’m still kicking and creating, and if I can imagine a cookie in the bathroom brush holder, I can imagine anything anywhere. I’m a writer, after all. It takes a special energy, over and above one’s creative potential, a special audacity or subversiveness, to strike out in a new direction once one is settled. It is a gamble as all creative projects must be, for the new direction may not turn out to be productive at all.